Born December 27, 1948, in the small country town of Chateauroux in central France, G�RARD DEPARDIEU is one of the world's most respected and well-known actors. He has been in 114 films (and counting), including seven in the year 2000. He has starred in French, British, American, Italian and German productions, and has been called "France's gift to world cinema," "the French De Niro," and the "Gallic giant." The third of six children of a poor sheet metal worker, Depardieu left school at age twelve and had a troubled youth, the details of which ended up in part in the film Green Card. He was a petty delinquent, ran away from home and lived with prostitutes. By chance he ran across a friend training at the Theatre Nationale Populaire (TNP) in Paris. He tagged along, showed promise, and was offered a position there sans tuition. He's been acting ever since. Depardieu has worked in the theater, starring in over 15 plays, including works by Marguerite Duras, Peter Hanke, David Storey, Israel Horowitz, Moliere and Natalie Sarraute, and others. But it's his motion picture career which is his greatest legacy. By the mid-'70s, Depardieu had co-starred in 11 French films, though he wouldn't enjoy widespread success until his role of a nihilistic but lovable petty criminal in director Bertrand Blier's Going Places (1974). Not long afterward, Depardieu could be found holding his own against acclaimed French actress Isabelle Adjani in Barocco and portraying a passionate Communist organizer in 1900 (both 1976). In 1978, Depardieu re-teamed with Blier for the Oscar-winning Get Out Your Handkerchiefs, and he went on to win France's prestigious C�sar award for his performance as a resistance fighter in The Last Metro (1980). After his portrayal of a 16th century peasant in The Return of Martin Guerre (1982), Depardieu could be found playing the title role in Danton, and he stepped behind the camera as co-director for 1984's Le Tartuffe. The 1990s were equally successful for Depardieu, particularly in the case of director Jean-Paul Rappeneau's 1990 version of Cyrano de Bergerac, for which Depardieu earned an Oscar nomination. He made his foray into American film in 1990's Green Card opposite Andie MacDowell . Though the bulk of his success still stemmed from French films (All the Mornings of the World , Germinal , A Pure Formality , and Colonel Chabert , to name a few) Depardieu nonetheless achieved moderate recognition in the American film market. Despite the failures of Ridley Scott's 1492: Conquest of Paradise (1992) and Steve Miner's English remake of My Father the Hero, Depardieu was praised for his performances in Kenneth Branagh's Hamlet (1996), Nick Cassavetes' She's So Lovely (1997), and Randall Wallace's The Man in the Iron Mask (1998), with Gabriel Byrne, John Malkovich, Jeremy Irons, and Leonardo DiCaprio. 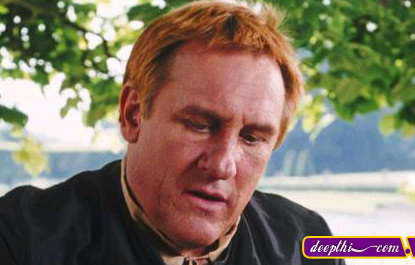 Despite two nearly fatal accidents -- he was involved in both a plane collision and a motorcycle accident -- and significant heart problems (he went through a coronary bypass procedure in 2000), Depardieu maintained his prowess in film. In addition to critically acclaimed performances in The Closet (2001), CQ (2001), City of Ghosts (2002), and Nathalie... (2003), Depardieu began work with internationally recognized French director Alain Chabat for RRRrrr! in 2004.